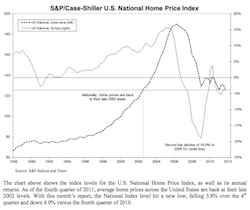 Home prices are the lowest they have been since the crisis began.Â The S&P Case-Schiller Index, which is a key gauge of home prices, fell 1.1% from November to December. Â Low home values prevent people from being able to refinance. Â Refinancing a mortgage is a great way to save hundreds of dollars a month. Â Without those savings, people aren’t able to spend as much, which hurts the economy. Â If you are upside down on your mortgage, read this. At the bank I work at, I have been tracking the appraisals that we have been ordering when we originate loans.Â My favorite thing to do (not really) is ask the client what they believe their house is worth.Â I then take them to sites such as Zillow and Eppraisal.Â Generally the price at these sites is about 25-30% lower than their estimate.Â Next, we order the appraisal.Â When the appraisal comes in, I present them with the fact that their house is even less, about 5-10% less than Zillow showed.Â This isnâ€™t every case, but it is much more common than to see a higher price on the appraisal.Â Here are some appraisal amounts in the past month. This may not always be the case, but it sure is uncommon to see the appraised value higher than the customer estimates. Â Of course most people incorporate sentimental value in their estimate, but even those who don’t are generally wrong. Â The only case that I have seen that the appraised value was more than the customers or Zillow’s was my parents, go figure. Â I warned them that the values were bad, but their appraisal came in almost 25% over Zillow’s price. Â Now this was almost a year an a half ago, but I was still amazed. 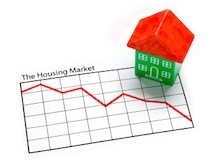 The only thing that I can say almost certainly, is that the housing market is going to take a very long time ro recover. Â I am going to take a guess of 10 years, but it’s a weatherman’s forecast if you know what I mean.